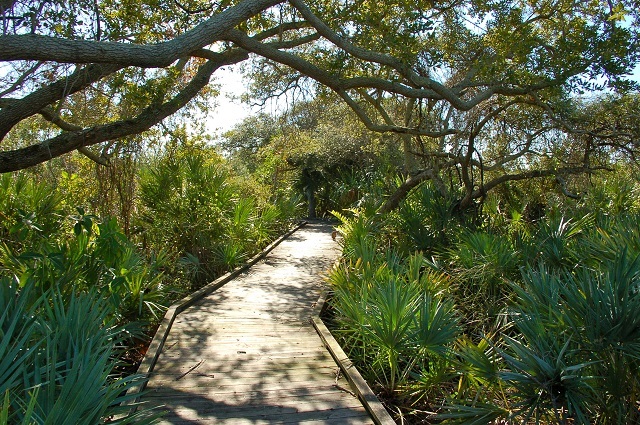 Another part of Brevard County’s Environmentally Endangered Lands (EEL) program and the Archie Carr National Wildlife Refuge complex, this parcel (not be confused with Coconut Point Park located north of here) features a 0.75-mile hiking trail through coastal strand, oak scrub, maritime hammock and mangrove swamp. Park at the Juan Ponce De Leon First Landing Park on SR A1A (restrooms available, plus views of pelicans, gulls and terns) and cross the highway on foot (watch for traffic) to the northern trailhead. Or, park your bicycle at the southern trailhead a few hundred yards to the south. A canoe-tie up on the lagoon side provides yet another route for entering the sanctuary. Florida Scrub-Jays (rare) occur sporadically near the northern trailhead. Common Ground-Doves and Loggerhead Shrikes may be found along the hammock edges or openings. The wind-sculpted live oaks can be good for Black-throated Blue Warblers, American Redstarts and Painted Buntings during migration. Check for Belted Kingfishers, Ospreys, Wood Storks, Great Blue Herons and the occasional Roseate Spoonbill from the observation platform on the Indian River Lagoon. Guided nature hikes can be arranged; call for details.